It turns out that the tricks of a pop-up book — the secret flaps, the dramatic pops, and the almost-three-dimensional reveals — are a perfect way to express the theatricality of Shakespeare’s plays, which are lively, fun, colorful, and surprising. In our new book, Pop-Up Shakespeare, the drawings by Jennie Maizels are all that and more, and we wanted our text to match her visual style. We think we’ve just about gotten away with it. Reducing Shakespeare onstage (in William Shakespeare’s Long Lost First Play (abridged), which we premiered at the Folger in 2016) and on the radio (in The Reduced Shakespeare Radio Show for the BBC World Service) turned out to be excellent practice for cramming the entire life and work of William Shakespeare into the pages of a pop-up book. Finding the perfect images to convey the essence of each of Shakespeare’s plays was a challenge not unlike finding the right way to stage his scenes, and the limited space (five double-page spreads) made the work of describing Shakespeare’s life and sometimes-problematic plays in a clear and concise and (most importantly) child-friendly way extra tricky. In Shakespeare’s time it was perfectly acceptable for dogs to perform on stage. But women as actors? Not so much. Shakespeare popularized the word puking. Our new pop-up book may popularize actual puking among folks who read the book. Although Shakespeare depicted many oddly matched couples in his plays, newly uncovered evidence suggests he did not actually write the play titled The Odd Couple. Shakespeare’s birthplace on Henley Street in Stratford-upon-Avon is probably much nicer today than it was in 1552 when Shakespeare’s father was fined for leaving a pile of dung outside. Apparently Shakespeare saw a very early production of West Side Story and decided to change the setting and remove all the music in order to create his masterpiece Romeo and Juliet. Before she became a big movie star, Anne Hathaway was married to William Shakespeare. Tragically, lots of very tragic things happen in Shakespeare’s Tragedies. Shakespeare’s play Cardenio is lost. Always back up your work. A cannon set the roof of The Globe Theatre ablaze during a performance of Henry VIII in 1613, making it the most interesting performance of that play ever. Contrary to popular belief, the story of Hamlet does not revolve around a small pig. 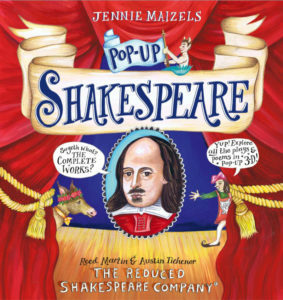 With text by Reed Martin and Austin Tichenor of the Reduced Shakespeare Company and artwork by Jennie Maizels, Pop-Up Shakespeare has just been published by Candlewick Press in the USA and Walker Books in the UK. It’s an irreverent and informative exploration of the life and work of William Shakespeare. Pop-Up Shakespeare is suitable for children from age nine to ninety-nine and is available now online and at your local bookstore. Reed Martin is a managing partner of the Reduced Shakespeare Company.